The Supermarine Seagull ASR-1 was a British military flying boat and the last to be built by the Supermarine company. Design started during the Second World War but it did not fly until three years after the war had ended and the project was cancelled without it being adopted for service. The Seagull had an all-metal construction with a two spar parasol wing mounted on a pylon connecting it to the fuselage. The single engine, a Rolls-Royce Griffon drove contra-rotating propellers; radiators were mounted below the engine in the pylon. The rear of the pylon accommodated an observer's position with two windows. An eye bolt was fitted on the wing, behind the engine, so the aircraft could be easily lifted from the water by crane. The wings were fitted with slotted flaps and full length leading edge slats and could be folded for compact, ship-board stowage. They also had a variable angle of incidence, pivoting at the front spar and actuated by an electrically driven jackscrew attached to the rear spar. This arrangement reduced stalling speed and increased lift, allowing the aircraft to use a smaller wing - compactness being an important feature for a ship-borne aircraft. Supermarine had tested this arrangement in the Type 322 and its capability was demonstrated when test pilot Mike Lithgow flew a Seagull at only 35 miles per hour (56 km/h). In July 1950, a Seagull competing in the Air League Cup Race gained the air-speed record for amphibian aircraft over a 100-kilometre (62 mi) course, by flying at an average speed of 241.9 miles per hour (389.3 km/h). The hull was a normal frame and longeron design with chines. The tailplane, carried on top of the fin, had a very large dihedral, with smaller fins mounted on its tips perpendicular to its surface. A third fin was later added to the centre after testing of the first prototype had revealed an instability in yaw. This was added to the second prototype while it was still being constructed. 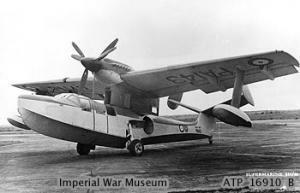 The undercarriage retracted into bays on either side of the fuselage and could be easily removed, saving 180 kilograms (400 lb) of weight when the aircraft was operating as a pure flying-boat. The Seagull was also fitted with an arrestor hook for carrier landings; mounting points for JATO rockets were located just above the wheel wells. The crew normally consisted of three. During air-sea rescue work, a Seagull would be able to accommodate a pilot, navigator and medic, plus up to seven survivors. Burnett, Charles and Eric B. Morgan. "Dumbo and Seagull:Two Pairs of Variable Incidence Prototypes". Air International, November 1982, Vol. 23 No, 5. ISSN 0306-5634. pp. 237-243, 251.